[by Kim Min Soo] The sturdy neat mannish look is rising among female stars. The mannish look is chic and adds a neutral charm, making it a style that is well suited for fall. Not only that but it is also easy for novices to style this look, it has the characteristic of simplicity where you can naturally express it. Without using showing items it instead gives off a classy chic mood with natural designs. 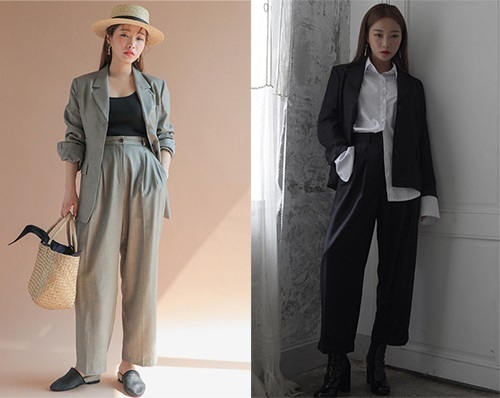 Recently catching attention by appearing with an overwhelming figure at public events through the mannish look was singer Soyou and model Choi Ara. What is the key point of presenting a mannish look? Singer Soyou who is the star that females want to become with her radiant skin, looks, and superior fashion sense. She who normally catches attention with her stylish and individualistic look appeared while giving off a unique charm. On September 6, she showed off a neat tidy suit look that matched well with the official event atmosphere as she attended the Hyundai Department Store Trade Center Laciento Launching Event held at Seoul, Samseong-dong. She boasted off a classy beauty through the calm pastel-toned mannish look. Although the entire style was plain, the height suit life point matched with the shirt finished off a perfect official event look. Model Choi Ara that has gained the interest of viewers through her role of haughty and haggard Jo Eun in JTBC drama ‘Age of Youth 2’. The combination of her black suit and short cut hair at the production press conference was the center of attention. Especially her model-like tall height added with her boyish oversized jacket and white pants presented the advantages of the mannish look. Bold accessories and subdued makeup make an eccentric mood. The mannish look has always been a loved style but this season the gray color is in the spotlight as a trend and will be even more loved by women. Especially as the oversized suit combination can present a classic yet sensible mood. If you slightly expose your collar bones you can add on a dizzying charm as well.